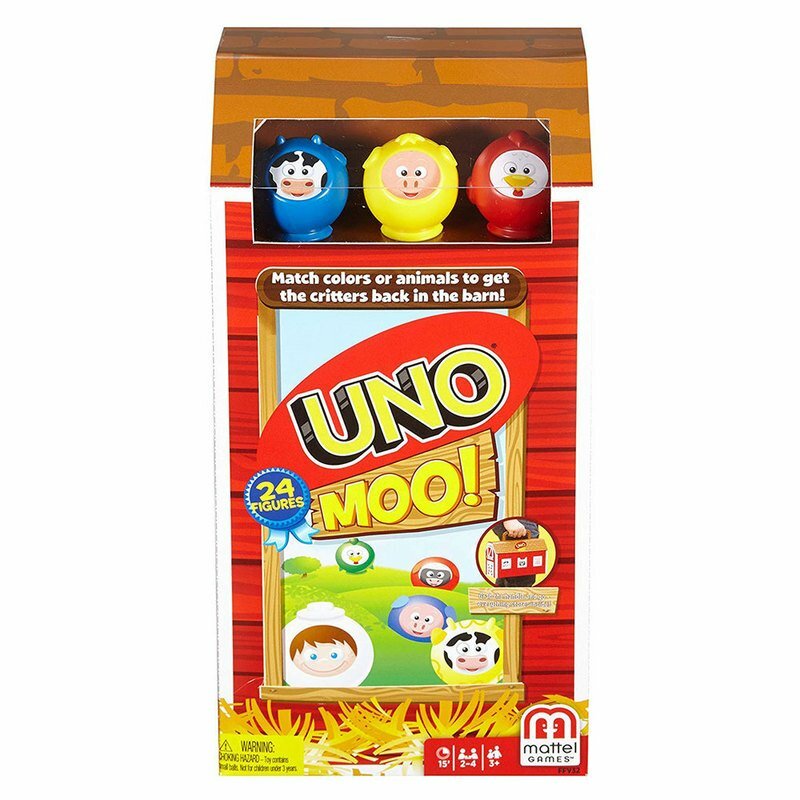 In UNO MOO!®, farm animals come out of their barn to play with you! Akin to the classic UNO® game, younger players round up the animals by matching their colors or types. To start, place all of the figures in the barn and mix them up. Each player then hides their figures behind a haystack and out of view of the other players. Players draw five figures from among the cows, pigs, skunks, chickens, dogs, sheep or farmers. The youngest person goes first. When a child plays a figure, they push the figure already on the barn door into the barn and then replace it with their own. The figure played will be the figure the next player tries to match. If a player does not have a matching figure or a farmer that can be played, they must draw one figure from the barn. If the figure they draw matches the color or animal on the barn door, or is a farmer, they may immediately play it. Otherwise, their turn ends. 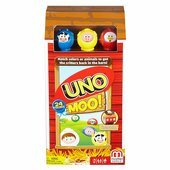 When a player is down to one figure, they shout “UNO Mooooooo!” The first one to get all of their figures back into the barn wins! Includes 1 play-and-store barn, 28 animal and farmer figures and 4 haystack partitions. For 2 to 4 players. 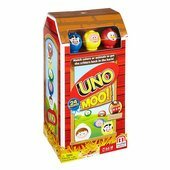 Hooray, it’s UNO MOO!®, a preschool version of the beloved UNO® game! Farm animals come out of their barn to play, and younger players round them up by matching their colors or types. Kids will have a blast playing with cows, pigs, skunks, chicken, dogs, sheep or farmer figures and putting them on the barn door and pushing others into the barn.